The discovery of arsenic is generally attributed to Saint Albertus Magnus, sometimes known as Albert the Great, as there are records of the bishop, scholar, and alchemist producing elemental arsenic in 1250 AD. However, arsenic compounds have been known since antiquity, and earlier alchemists may have accomplished this feat as well. Whereas many more recently discovered elements have names with Greek roots, arsenic’s roots are older, as the Greek arsenikon was derived from Syriac and Persian words for “yellow orpiment”, which is a naturally occurring arsenic(III) sulfide mineral. The name came into Latin as arsenicum, and to old French as arsenic, which was adopted as the English word for the element. Arsenic’s cultural history is curiously paradoxical, as it has been used as both medicine and poison for centuries. Hippocrates prescribed orpiment for ulcers, and ancient Chinese medicine used arsenic compounds to treat a variety of ailments. In the 18th century, Thomas Fowler made popular the patent medicine “Fowler’s solution”, a liquid formulation of potassium arsenite that was sold as a remedy for complaints as diverse as asthma, eczema, and malaria. At the same time, arsenic compounds were well known as poisons that they were used to kill pests and people in medieval Europe. The French knew arsenic trioxide, an odorless compound that easily mixed into food or drink, as “poudre de succession”--”Inheritance powder”, because it was used so commonly used in homicides. Intentional arsenic poisonings became less common after a reliable method for detecting arsenic in a diseased person, the Marsh test, was introduced in 1836, but many modern uses of the element continued to take advantage of its toxicity. A variety of arsenic compounds have been used as pesticides and herbicides and in wood preservatives, though the toxicity of such products to the humans working with them has led to their replacement by safer alternatives for some applications. The deadly properties of arsenic have even been weaponized--a number of chemical agents used in the first world war were arsenic compounds, and Agent Blue, one of the “rainbow herbicides” used in the Vietnam war, was a potent arsenic herbicide. Arsenic-based medical treatments also have modern counterparts. An arsenic containing drug called Salvarsan was developed as a syphilis treatment in the early 20th century, and remained in use until penicillin became available in the 1940s. The arsenic containing drug Melarsoprol is still sometimes used as a treatment for late stages of African trypanosomiasis--known colloquially as African sleeping sickness--despite significant side effects related to arsenic toxicity. Arsenic is also used in the treatment of several cancers, particularly in recurrences of acute promyelocytic leukemia following first line treatments. A third historical use for arsenic was in metal alloys. Early bronze was made from arsenic and copper; it was only later that tin replaced arsenic. Brass even today sometimes contain arsenic, which lessens corrosive loss of zinc from the copper-zinc alloy. The primary modern use of arsenic in alloys, however, is in lead alloys. The addition of arsenic makes lead, a soft metal, significantly harder, and such alloys are used in standard lead-acid car batteries. Other modern uses of arsenic have no historical precedent; a prime example is arsenic’s use in semiconductors. Arsenic is a component of many III-V type semiconductors as well as semiconducting compounds with more complex formulations. The most common III-V semiconductor is gallium arsenide. Gallium arsenide was developed in the 1960s as a semiconductor with somewhat different electrical properties than the more common silicon, and that is more suited than silicon to some applications. Notably, gallium arsenide is a direct band gap semiconductor, which means that it can both absorb and emit light with high efficiency. This lends it to use in LEDs and lasers. Additionally, extremely thin layers of gallium arsenide can be used to effectively absorb all the photons from incident sunlight, as opposed to the thick layers of silicon required for the same task. This allows for the creation of one type of thin-film photovoltaic cell. GaAs-based semiconductor devices also exhibit less noise than those produced from silicon, and are thus favored in many telecommunications applications. The other III-V arsenic semiconductors have similar uses to gallium arsenide, and semiconductors with more complex formulations are generally used in settings where the ability to tune the material’s band gap through adjustments to the precise molecular composition are desirable. In nature, arsenic is most commonly found in minerals in combination with sulfur and sometimes iron, nickel, or copper. The two forms of arsenic(III) sulfide, realgar and orpiment, were often used as sources of arsenic in antiquity. The most common form of arsenic used in industry is arsenic trioxide, which may be produced by roasting any of these minerals in air. Roasting the same minerals without oxygen present will produce metallic arsenic. Arsenic is rarely harvested directly, but rather produced as a side product of the mining and purification of other metal ores. Summary. Arsenic has numerous applications as a semiconductor and other electronic applications as Indium arsenide, silicon arsenide and tin arsenide. Arsenic is finding increasing uses as a doping agent in solid-state devices such as transistors. Gallium arsenide is a semiconductor material frequently used in optoelectronic applications. Arsenic is used in bronzing and for hardening and improving the sphericity of shot. Due to their toxicity, arsenic compounds are used in insecticides and wood preservation. Arsenic is available as metal and compounds with purities from 99% to 99.999% (ACS grade to ultra-high purity). Elemental or metallic forms include pellets, rod, wire and granules for evaporation source material purposes. Arsenic oxides are insoluble arsenic compounds available in powder and dense pellet form for such uses as optical coating and thin film applications. Arsenic is also available in soluble forms including chlorides, and acetates. These compounds can be manufactured as solutions at specified stoichiometries. Arsenic is a Block P, Group 15, Period 4 element. The number of electrons in each of Arsenic's shells is 2, 8, 18, 5 and its electron configuration is [Ar] 3d10 4s2 4p3.The arsenic atom has a radius of 119.pm and its Van der Waals radius is 185.pm. In its elemental form, CAS 1327-53-3, arsenic has a metallic grey appearance. Arsenic is found in numerous minerals including arsenolite (As2O3), arsenopyrite (FeAsS), loellingite (FeAs2), orpiment (As2S3), and realgar (As4S4). Arsenic was discovered in the early Bronze Age, circa 2500 BC. It was first isolated by Albertus Magnus in 1250. Though inorganic Arsenic is extremely toxic, even in very small amounts, other forms of arsenic have proven safe and even potentially beneficial to humans. Safety data for Arsenic and its compounds can vary widely depending on the form. For potential hazard information, toxicity, and road, sea and air transportation limitations, such as DOT Hazard Class, DOT Number, EU Number, NFPA Health rating and RTECS Class, please see the specific material or compound referenced in the Products tab. The below information applies to elemental (metallic) Arsenic. humans based on epidemiologic studies of, or convincing clinical evidence in, exposed humans. 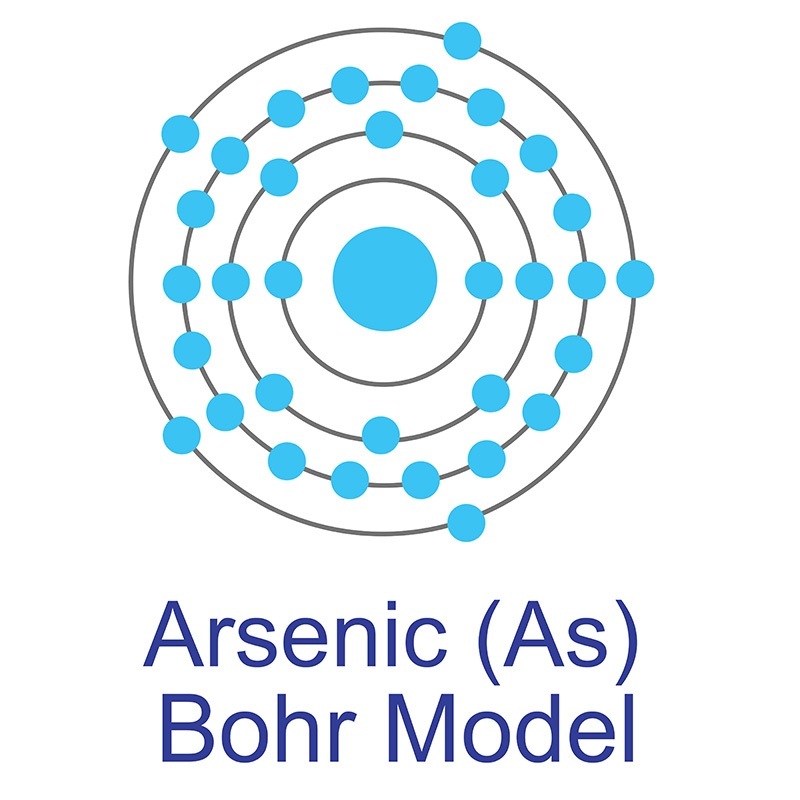 Arsenic has one stable isotope: 75As.